Reference number for this case: 17-Oct-54-Luzy. Thank you for including this reference number in any correspondence with me regarding this case. The newspaper indicates that on October 17, 1954, three people circulating in a car observed around 20 o'clock near Luzy a metal airship which flew at low altitude, at a vertiginous speed, illuminant the ground as in full day. 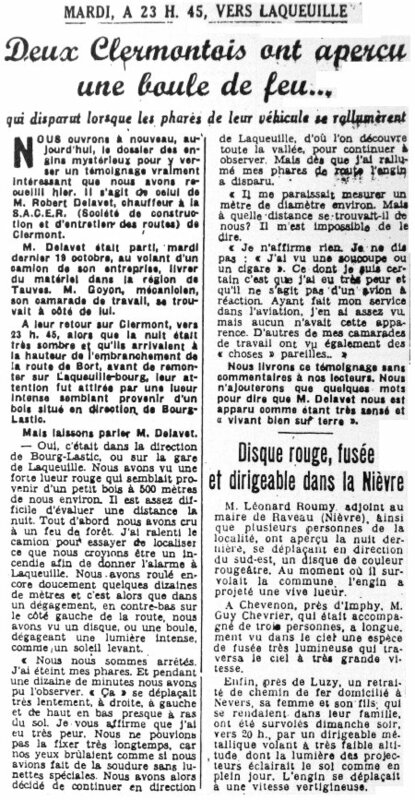 The source is noted as "La Liberté" for October 22, 1954. The website indicates that on 17 October 1954 at 20:00 in Luzy, France, a "metallic blimp flies extremely fast at low altitude. Spotlights light ground like day. An object was sighted that had an appearance and performance beyond the capability of known earthly aircraft. One metallic blimp-like object was observed in a residential area for two minutes." [jc1] Article dans le journal régional Le Journal du Centre, France, page 5, 3 novembre 1997. 1.0 Patrick Gross January 21, 2009 First published. 1.1 Patrick Gross March 15, 2010 Addition [jc1].